Like the Blues Brothers in the clip at the top of this post, I’m on a mission from God. However, I’m not getting the band back together. 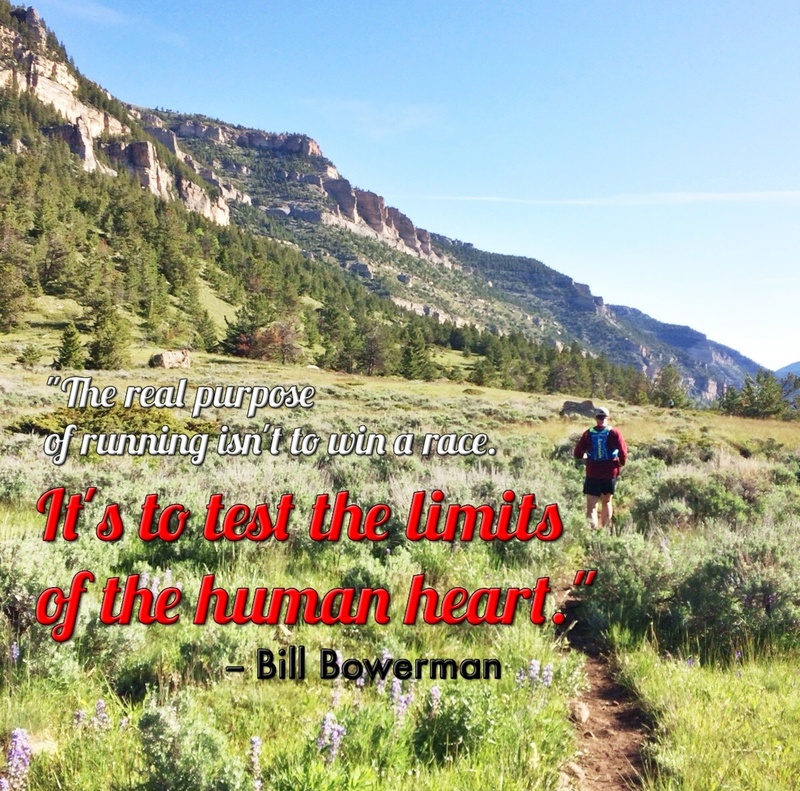 I’m on a quest to conquer the Bighorn 50-mile trail run next spring. And if you’re going to run trail races, you need to do your training runs on trails, which has proved difficult in my corner of southeast Iowa. That’s why I nearly jumped for joy when we discovered Geode State Park over the Fourth of July holiday. The credit for the discovery goes to my daughter, Laura. She’s got a bit of tree-hugger streak in her — that’s a good thing. She enjoys the simple things, like hiking and biking and spending time with family and friends. So during her visit over the holiday weekend, she wanted to take a trail hike with her mother and I, and Laura’s internet search for nearby trails turned up Lake Geode, which is about a 40-minute drive from Keokuk. What a neat place. This bobcat was recently spotted at Lake Geode State Park. Click on the photo to read more about the sighting. The park features a 7-mile trail around the lake. It’s mostly single-track dirt and rock, has some decent hills and easy creek crossings. At times, the trail is just inches from the lake. At times, it’s a few hundred feet away. Most of the trail is tree covered, which makes it runnable even on sunny, hot, humid days. The elevation gain/loss won’t compare to the trail in the Bighorns, but for Iowa, it’s a pretty good substitute. Before this discovery, I had run some trails at Shimek State Forest. But there really aren’t any maintained trails, outside of the equestrian trails. You can run the paths in the winter, but in the summer, they are overgrown with tall grass and twigs. It’s less than ideal. And we’ve run some trails near Peoria, Ill., where we’ve done a couple of trail races. But that’s a 2-hour drive from home, and really isn’t practical for routine, weekly runs. Since discovering Lake Geode, a friend also recommended nearby Argyle Lake State Park in Illinois. We’ll give that a try some weekend, too. And we need to check out Lacey Keosauqua State Park. I am so lucky to be able to head out my front door and be on some beautiful, low-traffic roads along the Mississippi River. I have a 20-mile route between Keokuk and Fort Madison that stays off of heavily trafficked roads for all but 4 miles, and much of it is along the river. It has both long, steep hills and some flat stretches. It’s a great road to run. But running on the trails in Wyoming has driven home the point that I really need to get in more training miles on trails. And with that in mind, it appears now I’ve found some viable options. 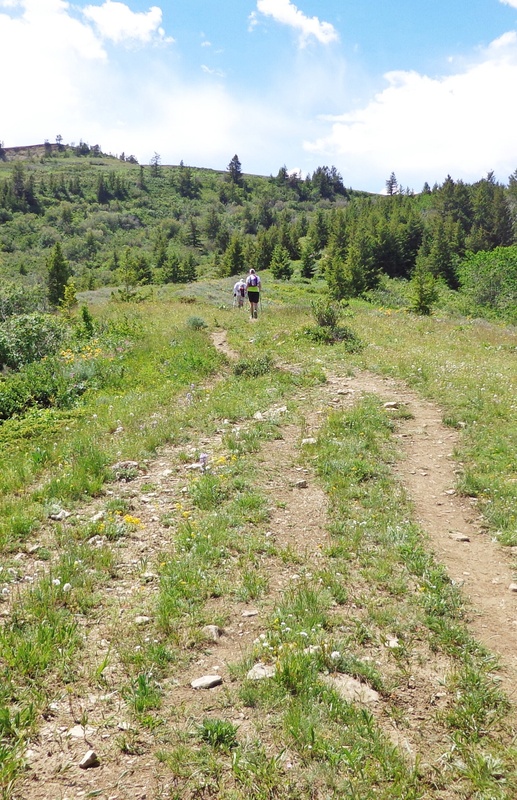 Rolling down the trail in the early miles of the Bighorn 50 trail run. 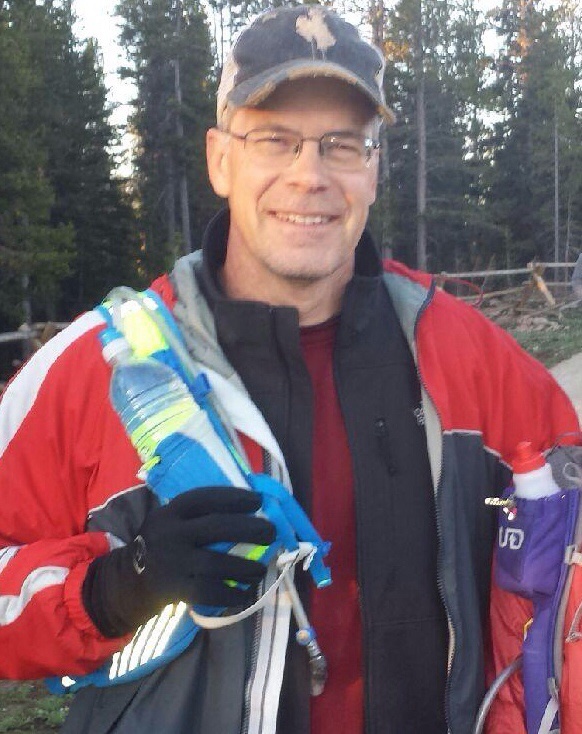 For the first 6 months of 2014, I trained with just one goal in mind: Competing in the Bighorn 50-mile trail run in the mountains just outside Sheridan, Wyo. When the temperatures in Iowa dipped below zero in January, I bundled up and headed out the door to log my miles. When we took a few vacation days, I rolled out of my cozy bed to get in a run. When I arrived home late one Sunday evening after a long drive across the state, I finished my 20-mile training run after 10:30 p.m.
Needless to say, I had a lot invested physically and mentally in competing in the Bighorns. So when my race on June 21 finished at 34.5 miles instead of 50, was I disappointed? Sure, I was disappointed, but I wasn’t crushed. The muddy, snowy, rocky, broken trails and the constant downhill slope in the early miles took a toll on my quads and ankles. I rolled my right ankle completely over twice, one time taking a spill onto a huge boulder and uttering a few words of which my mother would not approve. As I plowed downhill for those first 18 miles, I made friends with a fellow runner who was moving at about the same pace. We were keeping an eye on the clock, knowing that the first time cutoff was approaching. We’d make that first cutoff, I told her, but we weren’t going to have much extra time to spare after that. But between the quads, the hamstrings and the ankles, I thought I was going at the maximum controlled pace that I could manage, even if it wasn’t the pace that I had hoped for. I’m not a great downhill runner, and that was borne out. 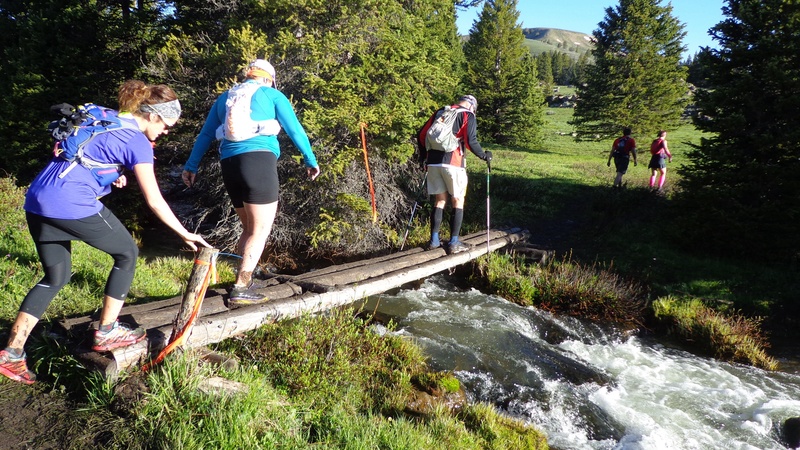 We did make the Footbridge Aid Station about 30 minutes before the cutoff. Despite needing to replace the tape on one foot and dealing with some rather troublesome cramps, I hustled out of Footbridge by myself with about 10 minutes to spare. From there, it was straight uphill for three miles, gaining 2,300 feet in that span. It’s a stretch of trail that’s aptly nicknamed The Wall. Having met up with my friend again, we hiked and huffed and puffed our way to the top of the ridge at the Bear Camp Aid Station. My friend decided to return to Footbridge, where she could catch a ride back to town. For the next 13 miles, I was on my own. A pair of runners power-hike The Wall just ahead of me. With no one to push me, without the aid of my GPS watch providing information on my average pace and knowing I was already flirting with the next cutoff, it would have been easy to slack off. But I decided I was there to finish in the best possible time I could. I had family waiting for me at the Dry Fork Aid Station — my brother and his daughter had driven up from Casper; and my wife, who has always been there for me during these crazy adventures. I knew that by now my niece would have already passed through Dry Fork on the way to her own strong finish. I wanted to give it my all until there was no more left to give. So I ran when I could, and I hiked when I had to. But, as my wife would say, I made forward progress. I hustled out of Cow Camp Aid Station knowing that with 6 miles to go, I wouldn’t make the cutoff. I wolfed down fried potatoes and 7Up with another runner, and he suggested that we might as well walk and enjoy the scenery because there was no way we’d make it to Dry Fork in time. But I was still committed to recording the best time possible. I broke out my music player for the first time and left the aid station with the strains of Bonnie Raitt urging me on. (Love this song, and its reference to “small house under a Big Sky” always reminds me of Montana.) I probably ran the hardest in the last few miles before Dry Fork, knowing I wouldn’t make the cutoff and fearing I’d be caught up in the sweepers. In the last 13 miles — from Bear Camp to Dry Fork — I passed 16 runners. It wasn’t about a better finishing time than someone else — hell, I was going to miss the cutoff time and be a DNF — but it was a way to measure and push my effort. I was going to give it my all, although on this day, my all wasn’t good enough to complete the 50-mile race. Even if I had made the cutoff time, I’m not sure I could have gone on. Maybe a better statement would be “should have gone on.” I know I would have tried, just because I’m stubborn that way. But when I topped that last brutal hill at Dry Fork, there wasn’t much left in the tank. I fell short of my goal — finishing the Bighorn 50 — but I learned a heck of a lot about the race’s overall challenge, about the course and about myself. And when the third week of June rolls around in 2015, I know I’ll make a better run having put forth the best effort I could in 2014. My niece Melissa, left, and several other runners cross a stream. Coming from the flatlands, my quads and calves weren’t prepared for 18 miles of downhill on an uneven trail. My son is a big fan of weighlifting, and I told him those opening miles were like doing squats for 4 hours. To prepare for next year, I’m going to add weight room sessions. The treacherous footing posed by the mud and snow had me concerned about starting in my Hokas, so I started with my trusty Asics Nimbuses. But these shoes lack the stability in the heel to deal with the precarious footing, and my heel kept kicking out to the side. I need to run more trails. There aren’t any trails near my home, but I’ll have to make the effort to drive to some or find some races that will give me time on the trails. Iowa trails aren’t the same as Wyoming trails, but any trail time is better than road time. I need to run more hills. There’s a one-mile long hill on my running route, and I ran repeats there several times. But I need to do that several more times … with more repeats. And I need to simply run more miles. My longest run was 30 miles, although that was part of back-to-back long days. I had planned a 35-miler, but time lost to injuries kept me from making that run. I need to start my training cycle far enough out so that I can still make a 35-miler or at least two even longer back-to-back runs. Here’s my video race report of the 2014 Bighorn Mountain Wild and Scenic Trail Run 50-miler. It was my first ultra in the mountains, and the trails were challenging, but the scenery was thrilling. Enjoy! I’ll post a story in the next few days. The Bighorn Mountains tower over an old barn near Sheridan, Wyo. Photo by Betty Jo Tindle, Creative Commons license, via Wikimedia Commons. The moment of reckoning for my “A” race in 2014 is rapidly approaching. Every year, I set a running goal that takes me out of my comfort zone, as I wrote about in this blog post. 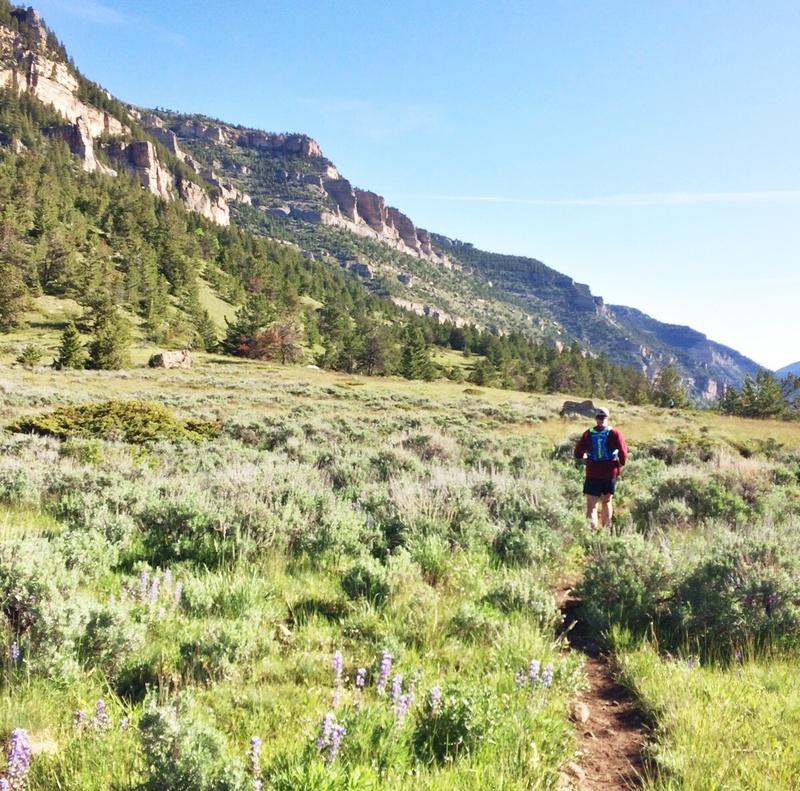 This year, my stretch goal is the Bighorn Trail Run 50-miler. I completed my first ultramarathon last year when I ran the nearby Potawatomi Trail Run 50. So while I was sitting around this winter, it seemed like a good idea to tackle another 50-miler, this time in the mountains of Wyoming. Why the Bighorn race? I used to live in Montana, and my sister and family lived in Sheridan, Wyo., which is the main headquarters for the race. I love Wyoming. I love the Bighorns. And it just seemed like a worthy stretch goal. I’m not going to bore you with the usual rundown on my training. My hamstring hurt, my mileage has suffered, yada yada yada. The altitude worries me, the elevation gain worries me, yada yada yada. If it was all easy, it wouldn’t be a stretch. In about a month, I’ll know how big of a stretch it was. 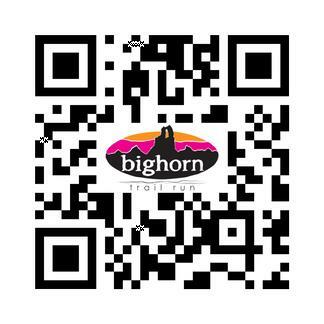 Bighorn Trail Run home page. The race features 30K, 50K, 50M and 100M distances. Here are a couple of reviews on the race, one by Sherpa John and another by Greg Redding. Both of these posts are about the 100, but it’s an out-and-back course, so the 50 starts at the midpoint for the 100. Here’s a post from Ultrarunning magazine. Barb is on the waiting list for the 30K (18 miles). Here’s a good blog post about that run. Here’s a link to Sheridan, Wyo., and a map locating Sheridan, and a map locating Dayton, which is the actual finish for the race. Since the 50 starts on top of the mountain at nearly 9,000 feet, weather has been a concern. Here’s a link to several weather stations on the mountain. If you hover your mouse over the blue dots, the name of the station will appear. Look for the dots northwest of Sheridan. “Bald Mountain Campground” is near the start line. The race proceeds to the east from there, and ends in the valley in “Dayton.” We’re still a month out, so the weather will change a bunch, but right now, it’s still snowing on the mountain. 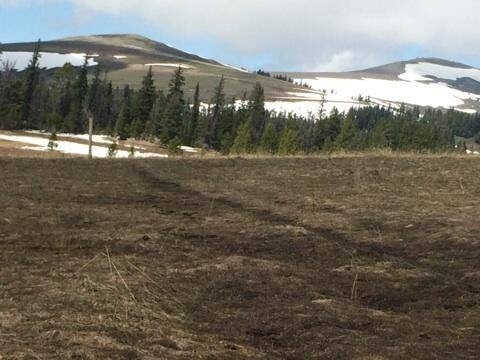 If you like to read novels or watch Westerns, the Bighorns may seem vaguely familiar. Perhaps you know them as the stomping grounds of Walt Longmire, the sheriff of the fictitious Absaroka (Wyo.) County. The books, by Ucross, Wyo., author Craig Johnson, are engrossing, and the A&E television series is entertaining. Closer to race day, I’ll post a link that will allow you to follow my progress — maybe. I’m just not sure how well everything is going to work in the backcountry. Wish me well on my last few training runs and say a little prayer on June 20th.